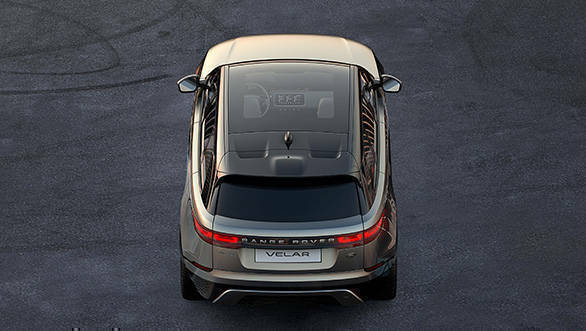 If you have gone through our exhaustive list of launches expected at the 2017 Geneva Motor Show, you must have come across the Land Rover Velar. And now there is confirmation from the British luxury automobile brand which has released a teaser image of its upcoming Velar SUV. The other details will be out on March 01, 2017, before the motor show. The Velar (pronounced vel-ar) gets its name from the first 26 Range Rover prototypes that were made in the 1960s. To keep the identity of these models a secret, Land Rover had named them Velar that means covered in Latin. Land Rover released only the rear profile image of the upcoming car. One can see the infotainment screen, panoramic sunroof, roof-mounted spoiler and the sleek LED tail lights. From the looks of it, the Velar seems to borrow its design cues heavily from the Evoque. The Land Rover Velar is believed to share its underpinnings with the Jaguar F-Pace. The Velar will be the fourth Range Rover SUV after the Evoque, Sport and the flagship Range Rover. The Velar will be slotted between Evoque and the Range Rover Sport. Gerry McGovern, chief design officer, Land Rover, said, "We call the Velar the avant-garde Range Rover. It brings a new dimension of glamour, modernity and elegance to the brand. The Range Rover Velar changes everything." The Land Rover Velar will compete with the likes of the Porsche Macan, BMW X6 and the Mercedes-Benz GLE Coupe. The Land Rover Velar has already been spotted testing at different parts of the world. We believe Land Rover will launch the Velar in the international markets by the end of this year, quickly followed by its Indian debut.